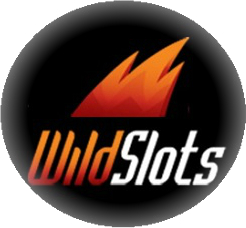 WildSlots is the new kid on the block, as they themselves openly state. It has been launched very recently but the team behind it already boasts several successful projects, such as Casino Luck and Next Casino. This certainly helps WildSlots gain trust, even if the Casino itself doesn’t have a long track record. Unlike its sisters, it’s catering exclusively to slots fans. An exceptionally large game library is accessible to players around the world, including UK gamers, though there are some country restrictions linked to particular software providers. 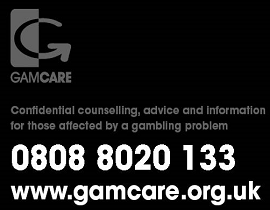 The casino is licensed by the Maltese Gaming Authority which is a guarantee you’ll be treated fairly and play in a safe and secure environment. Wildslots Review First Impressions: Fun! At first sight, Wild Slots looks cheerful and I’m thinking it will be a fun place to play – as the team behind it promises. I like it that, on top of regular menu items, there is also a Site Map. It often helps me access every single part of the website and collect the information I need. Seeing as there are more than 800 games available, I’m already excited. I hope it’s true. Otherwise, the setup is pretty standard, banners on top advertising various promotional offers and the rest of the space dedicated to games. Scrolling down, I spot the current jackpots overview which displays some VERY high values, but we’ll get to that in a bit. I also see Facebook and Twitter buttons, which I generally appreciate as not many online casinos recognise and use the possibilities offered via social networks. We’ll see how good a job WildSlots does in this regard. Overall, my first impression during my Wildslots review is pretty positive, let’s see if the rest of the content justifies it. The promotional banner tells me there is a £500 welcome bonus so I click to check out the details. And it says you can get 100% bonus on the first deposit, up to a maximum of £50. Wait a second, what happened to the £500 advertised? After a bit of digging, I get it. When you make your 2nd deposit, it will be matched by 50% up to £250 and the 3rd one by 75% up to £200. So all £500 is accounted for. The minimum deposit required to qualify is £10 and bonus amount has to be wagered 40 times before you can withdraw deposit, bonus or the resulting winnings. It’s a good thing bonus is not sticky (can be withdrawn), but WildSlots gives you only 15 days to meet play-through requirements, which is a bit short. As is usually the case, not all games contribute the same. The majority of slots make a 100% contribution, except for those featuring progressive jackpots and a few classic ones. Each month your 1st deposit gets you a 50% Monthly Reload Bonus, up to £200. This one comes with very friendly wagering requirements of only 13x bonus + deposit amount. While there are some seasonal promotions on offer from time to time, none are available at this particular moment. The only other ongoing promotion I found during my Wildslots review is a comp scheme, allowing you to collect Frequent Player Points which can be exchanged for hard cash. You are automatically signed up to WildSlots rewards program as soon as you register. FPPs are accumulated by real money wagers, each £10 wagered earning you 2 FPPs. Once you collect 100 points, you are entitled to £1 cashback. The good news is points have no expiration date, which is not always the case. Occasionally, WildSlots will run special promotions which can boost the amount of your FFPs. It might be a good idea to opt in to receive email newsletters which will inform you about these, otherwise you might miss out. OMG, the list of deposit methods is never-ending! It’s a good thing, don’t get me wrong, I love having a large choice (even if I’ll probably use credit card each time, LOL). Credit cards on offer include Visa, MasterCard, Maestro and Intercash. List of E-wallets features the popular Skrill and Neteller, among others. You can also use one of two prepaid cards, Paysafecard and Astropay, though in this case you’ll have to make your withdrawals via Bank Transfer (a bit slow). Then there is a list of 20 different Instant Banking methods, but the majority can be used for deposits only. Finally, there is the option of 3 mobile payment methods, including DotPay, Zimpler and PayForIt. Transaction limits vary, depending on which method you choose. The minimum is £10 or £20 and maximum £5,000. If you’ve already gone through a verification process and use an E-wallet, you could receive your money within several hours. Not bad at all! The most you’ll be allowed to withdraw is £25,000 per month. Like I said, this casino focuses on slots and there are no other games you can play. I actually appreciate this. Instead of trying to do a bit of everything, they make sure they do one thing well. That’s probably why you can find over 800 titles and a variety provided by a number of different developers. And good ones, too! The list includes NetEnt, Microgaming, Play’n GO, Nyx, BetSoft, EGT, iSoftbet, IGT, Lega and Quickspin. Very conveniently, you can filter the games by providers as well. They all come with “Practice Play” button so you can give them a try before investing any cash. And they are in Flash and can be played online, no download needed (yay!). Oh my God, where to start? I feel like a kid in candy store. The special treat is seeing almost 40 BetSoft games, and even one I haven’t played before. House of Fun has such a fantastic intro video, it’s likely I’ll re-start the game just so I can enjoy it one more time. I’m guessing many of you are NetEnt fans, so you’ll be happy to know there are more than 100 of their video slots included. Of course you’ll find each and every one of the classics, but the new releases also seem to be accounted for. Motorhead, Warlords: Crystals of Power, FairyTale Legends, Secrets of Christmas… yep, it’s all there. When it comes to Microgaming, you’ll have more than 300 games to choose from. It might not be their entire portfolio, but it’s pretty awesome. 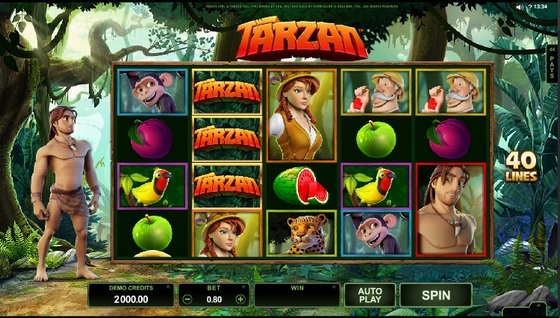 The recently launched Tarzan is included, with a bonus wheel featuring free spins, pick-a-potamus bonus, cash prizes and a jackpot worth up to 1,000x your total bet. Selection of Play’n GO titles is also quite generous and includes great video slots such as Grim Muerto, Book of Dead, Eye of the Kraken and the new, sinfully-good 7 Sins. With hundreds of NextGen and IGT slots, it actually looks like there are more games in this section than the casino reports. Now isn’t that refreshingly different! The selection of classic slots is, naturally, more modest, but still gives plenty of options to you nostalgics out there. The more popular ones I found during my Wildslots review include Super Nudge 6000 and Jackpot 6000 by NetEnt, and Microgaming’s Couch Potato and Break Da Bank Again. Couch Potato is a 3-reel slot with 1 payline, featuring the traditional BAR, cherries and sevens, but also a Wild icon which multiplies the wins by x5. I’m personally not a big fan of classic slots, but this one is kind of cute and can also pay handsomely. Now we come to the juicy stuff, the progressive jackpot games! There is a choice of more than 30 „make-me-instantly-rich“ options, some of which can truly turn you into multi-millionaire in seconds. Mega Moolah and The Dark Night currently stand at almost €5.7 million, and there’s also a couple at “only” about €1 million, such as Hall of Gods and Mega Fortune. I’m dreaming already… And, to tell you the truth, struggling to think how I’d spend more than 1 million. Weirdo. As long as WildSlots remains focused on slots, and until someone thinks of how to play those live, this section will remain empty. As already mentioned previously in the Wildslots review, no table games in this establishment. Only slots. Period. Looking at contact options, I see there are two ways to communicate with WildSlots directly: via 24/7 live chat and email. As I don’t see a chat window, I guess you have to register before it becomes visible. Don’t like that too much, but there it is. So, I register and, darn it, still don’t see it, even though it’s supposed to be „just a click away…found in the top menu on all WildSlots pages“. In fact, live chat can be accessed through Contact button, so I guess that’s good enough. Perhaps social networks are another way to get quick answers? Unfortunately, Facebook and Twitter links lead back to the web page. Shame. The desktop version is well organised and easy to use. When I switch to my Android tablet, I’m even more impressed. This is probably the easiest to navigate mobile site I’ve ever seen and all the relevant information just 1 click away. Another lovely surprise: there are almost 400 video and classic slots to play while I’m away from home and bored stiff. I know for a fact that not long ago there was less than half, so clearly the Casino is continuously improving their mobile offering. Good work, guys! If you want to access WildSlots while you’re out and about, you’ll also be able to do so with a help of iOS and Windows mobile devices. Directly in your browser, no apps to download. Not to beat around the bush, I love this casino! Ok, there are some areas for improvement, but all in all I think this is a great gaming venue for any slot fan. With a library which contains more than 800 titles and developers such as NetEnt, Microgaming, BetSoft, NextGen and all the others, there is no chance you won’t find something you like. Even if you’re playing on the go! Just as in 99% of other online casinos, the mobile offering is smaller, but in this case it’s larger than some of the others’ desktop range. Clearly, if you prefer table games, this is not the place to be. But WildSlots state openly what their area of expertise is and I, for one, appreciate it. 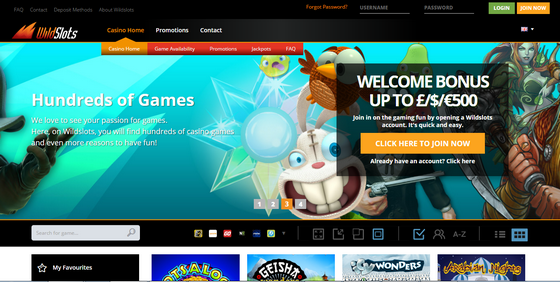 Much more than all-in-one sites which claim to have it all, only to provide no more than a dozen other casino games. The promotional portfolio, on the other hand, is obviously more modest than many of their competitors’. Adding a couple more ongoing offers would make it perfect. When it comes to banking methods, there’s nothing I can criticise. Options are in abundance and withdrawals super-fast. In short, if you are into online slots, look no further; this is where you’ll want to play.